There are some absolute and undeniable things that I am looking forward to in my kids' lives. One of the absolute cannot-wait-untils for Sarah is dance class. There is something so sweet about little ballerinas. I don't expect for Sarah to do dance her whole life. And I don't know if I want to be a dance mom. But I do want those quintessential memories of excessive hair gel and glitter. I have pictures of me in my sparkly tutus from dance class in GA when I was in 1st grade. 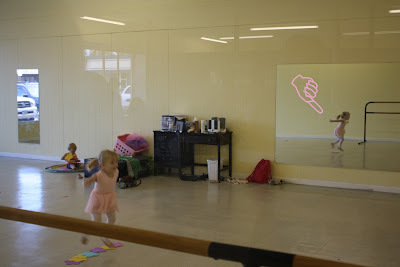 And with how much Sarah loves June from the Little Einsteins I know she'll love dance class too. A friend recommended Millington School of Dance to us so I looked into it. They have to be 3 and (obviously) potty trained. 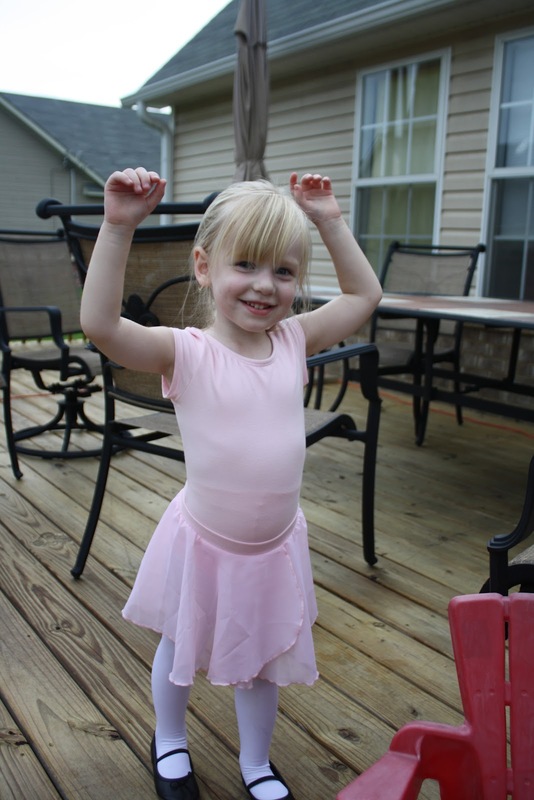 So I started on the potty training back in June so that by the time Sarah turns 3 in December we'll be potty perfect. Annie also talked about putting Jessie in dance so I told her that's where I was going to start Sarah in January. 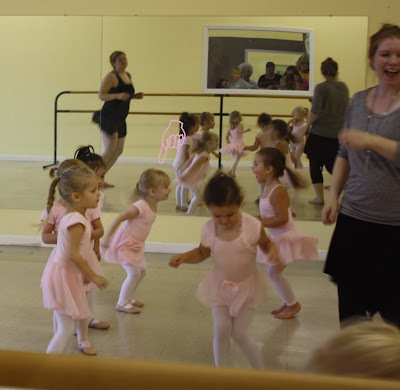 Well, back in August they had a little KinderMusik preview at MSoD on the same day as the Tippy Toes classes. 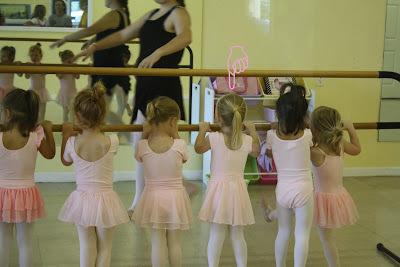 I was bored and wanted something to do so we went to go check out the KinderMusik class. (I was not impressed.) Sarah had big eyes as she watched the little girls run around in their pink leotards. 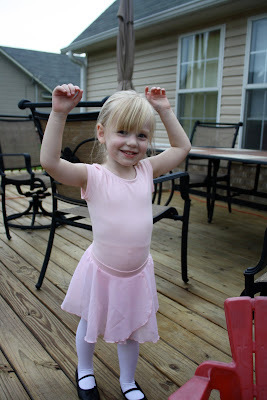 She told me multiple times that she wants to be a ballerina. So on the way out I decided to pick up a form and ask a few questions. As I was talking to the school owner I was absolutely deflated to find out that dance class is like a real school class. If you're not the right age by September you don't get to go to school. So there is absolutely no way for Sarah to join second semester when she turns 3. The owner said she has let people who were about to turn three join the class early but made an "ehhhhh" face when I said Sarah didn't turn 3 until the end of the year. Then the nail in the coffin was when she asked if Sarah was potty trained and I hesitated. She's my first I'm not quite sure when to say, "Yes! She is potty trained." Right now we still have the occasional accident, maybe one a week and I still put her in pull ups for naps and night time. So the owner pretty much told me no but that Jessie was able to join right now because they had 1 more spot left in Tippy Toes 3. So I called Annie and let her know. And her hubs ran right over the next day and snagged that last spot. And I was pretty sad. Annie and I were really looking forward to doing dance class together. The girls are BEST friends and they just love to be together. So here, once again, Jessie will be a year ahead of Sarah just like she will when school starts. Dance just wouldn't be as fun for either of us if Sarah had to wait until next year to start. So I was depressed over that for a couple of days. And I moped and pouted to Annie. Then I started to do what I do best. And that's to make no's yes's. So step 1....do I have any connections. Hm....yes. Yes, I do. So I called my friend Jen who teaches a couple of yoga classes over at the MSoD and explained the situation and asked her to talk to the owner for me. Then I checked in with her what I'd like to think was every other day but it was probably every day. She kept telling me she'd sent her a text, and a message of FB but hadn't heard anything back yet. Then she'd call her again for me. Time was running out! I needed to get Sarah into that class by Tuesday or I could pretty much give up hope. So Tuesday during nap time I ruminated over the situation. The owner never actually told Jen no. Or at least Jen never actually told me the answer was no. So that meant there was still room for a yes. And with that hope, I paced and planned for 2 hours during nap time. I figured my best and last chance was to get up there before the first Tippy Toes class starts at 3:30. That if I could just make it up there before then and plead my case I could get a yes. So at 2:50, I threw Sarah's bedroom door open. Got her dressed told her to get in the car we were going to dance class. Then I grabbed the kid's allowance envelop because I was going to pay whatever I had to to make this happen. Snatched Cody up, put him in his car seat and then burned rubber up to the dance studio. And then I put my only talent on full display. I ran my mouth. I ran my mouth and let the BS flow. I told the owner about how Sarah has a late birthday and so she's going to miss out on so many things. 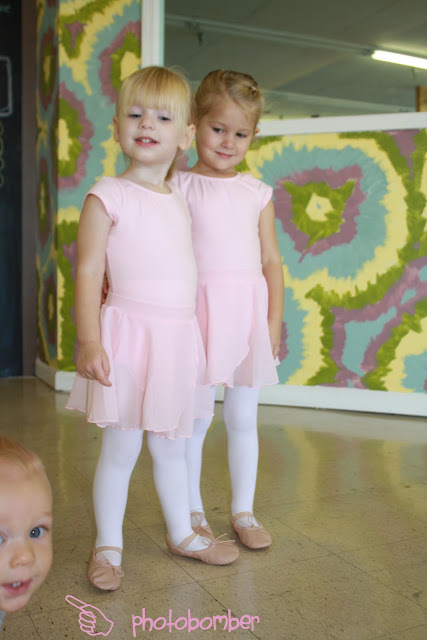 And how her best friend Jessie, just joined the class and we had been talking to the girls about them doing dance together. 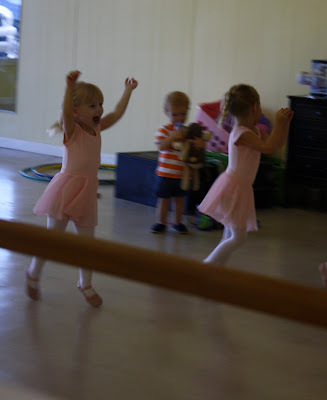 And they were so excited and Sarah wants to be a ballerina just like her best friend Jessie. I told her about how Sarah's favorite Little Einstein (because the studio owner has a toddler so I knew she'd know that show) is June and how all she wanted to do was show June her ballet moves last time we were at Disney World. I promised that I would practice with Sarah at home since we would be a month behind the class. I explained that Sarah was potty trained and that we haven't had an accident in over a month (that was a flat out lie...Sarah had 3 accidents the day before). And that I only hesitated to say she was potty trained because she still wears pull ups to bed at night. I talked about the extensive vocabulary Sarah has and how she is very easy to communicate with. I told her I came prepared to do whatever it took for Sarah to have a chance that I'm ready to go straight from here to Cordova Dance to buy all the clothes and shoes she'd need for class the next day. 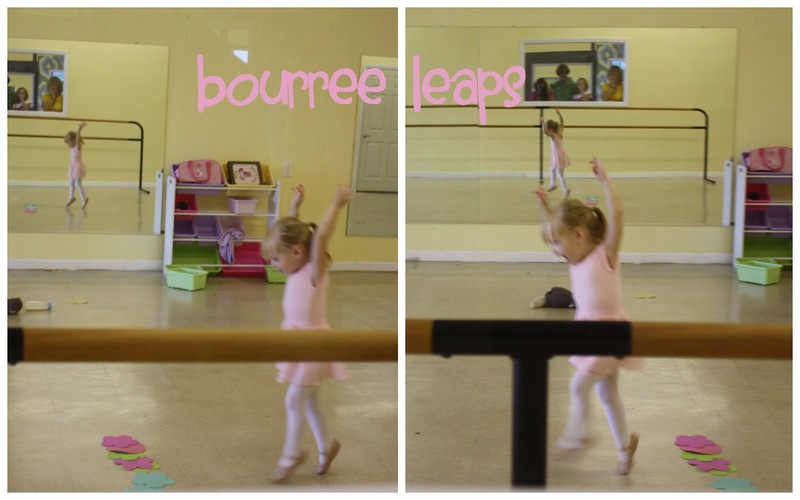 (To which the owner said, "I wish all of my dance parents were this enthusiastic.") I pretty much just kept talking because if I don't give you a chance to speak then you don't have a chance to say no to me. And then I hit the home run by saying how I thought dance was so incredibly important because it's more than just learning moves. 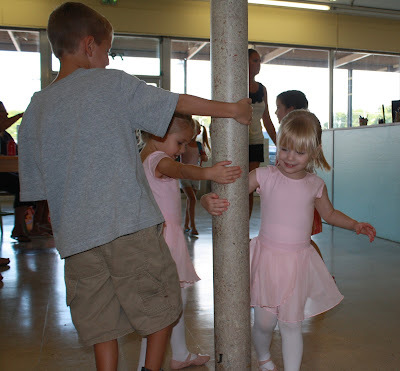 It teaches children how to be self confident, to control and understand their bodies, to be proud of themselves. It gives them musicality and higher cognitive levels. That it can teach them grace and poise. And most of all it teaches them about dedication and hard work and the beauty that comes from it. To which the owner finally gave up and said, "I agree. Let's see if there is any room left in that class." She also at one point while I was doing my random rambling said, "So you're Jen's friend?" Ha! I guess Jen had been hounding her for me too and she might have thought that "oh crap, this woman is nuts and she's not going to leave me alone." So while I filled out the paper work and plunked down the enrollment fee and first month of tuition she reminded me multiple times that this was "just on a trial basis" and that I had to "promise not to take it personally or get my feelings hurt if it didn't work out." And from there we did go straight to Cordova Dance and on the drive I called pretty much everyone in my phone book to tell them about what I just accomplished. And as we tried on shoes and leotards and skirts Sarah had a huge smile on her face and told me, "Mommy! 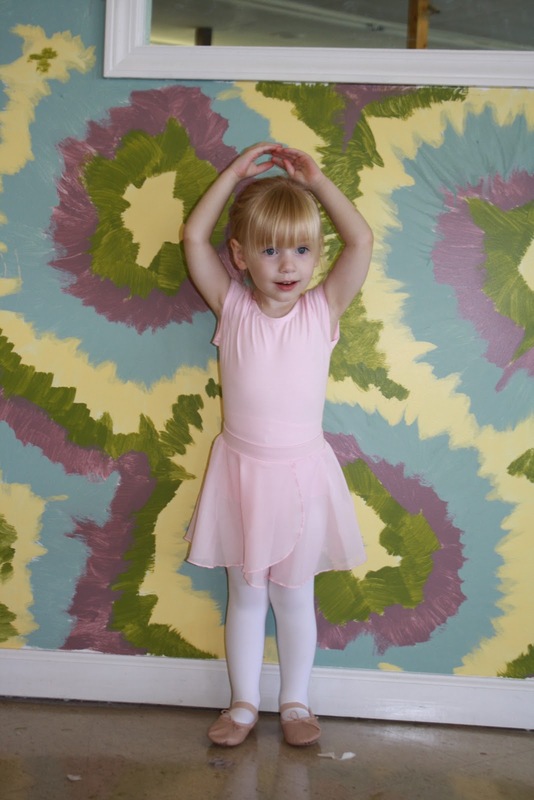 I'm going to be a ballerina just like June!" Sarah and Jessie before class. Cody didn't want to be left out. Before class doing her "ballerina arms". They girls entertaining themselves before class started. I got there crazy early, like 30 minutes early, because the parking lot stresses me out. It's horribly designed and hard to find a spot. Now I still get there really early about 15-20 minutes but less frazzled and crazy faced. Time for class to start! They begin with stretching. And then typically do some ballet bar exercises. I really love the reflection in this picture. So every week they still practice bourree leaps. And every week Sarah still bourrees all the way up to the flowers and then stops to hop over and the bourrees up to the next set of flowers and stops. It's so cute! 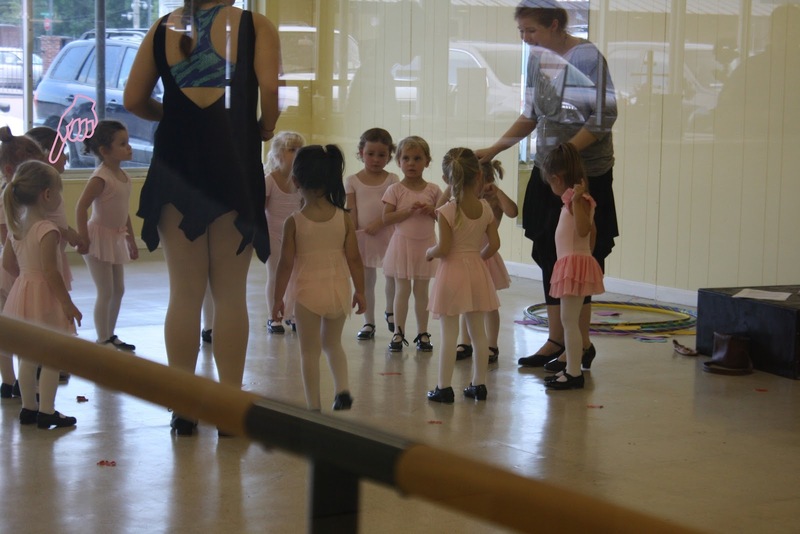 Then after ballet time they come out for a shoe change to get ready for tap time. Every week she is so happy when she comes out for a shoe change and tells me, "Mommy! This is so fun! I love it!" So I'm glad we're doing it. Whenever I peek in during tap time she's usually just standing there or she has just fallen down. But she tells me that tap is her favorite. So we'll see. They are doing a tap dance at the recital so I hope she can work on the whole falling down thing so that I don't have that kid at the recital. After tap they come out either for a shoe change back into their ballet slippers or just to give their tap shoes back to their moms if they have the roll up kind of tights. Then they finish class with "creative movement" where they do fun dances to different songs. Sarah LOVES dance class. She is so excited on Wednesdays and tells me that it's a dance day and after her nap we're going to get up and go to dance class and see Jessie. She's even stopped fighting me about having to put her hair up in a ponytail. Though I did ask her the other day if I could put her hair up and she told me "No. Let's just do that for dance class. Ok mom?" I'm glad the studio owner let Sarah join the class early. I really don't think it would have been the same if Jessie hadn't been in the class with her. And she just loves it so much. I'm glad we're doing this for her. Of course I was hounding her for you!!! I'll choose to call you persistent rather than a total BSer, but way to go! I can really tell she loves dance. I wouldn't be surprised if she did stick to it! She's adorable to the max.